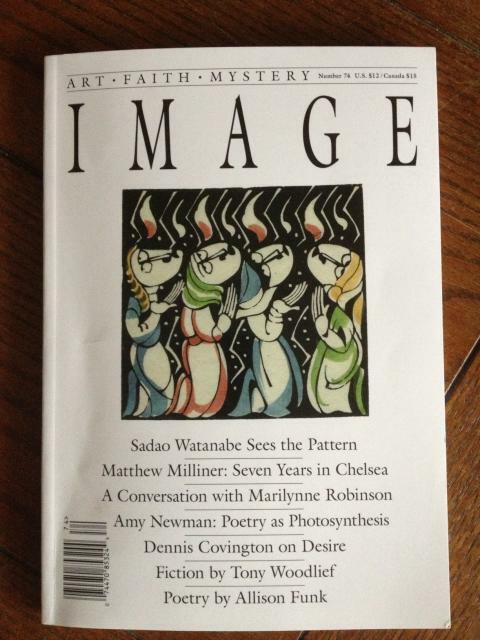 My latest short story is in the current edition of Image, for those of you with a literary bent. And for those of you bent theologically, in this case, because in my story John Calvin attends a writing workshop so he can learn to craft Christian romance novels. That’s not what the story is about, mind you, but I had fun with it all the same. And I think I treated him better than he deserved, if that’s any consolation to my Reformed friends. The story is titled “Elective,” which was practically foreordained, if you think about it. If you’re so inclined you can order a copy here, or even better, get yourself and someone you love subscriptions to Image. Modern Christian churches have done so much—largely unconsciously but sometimes purposely—to destroy the great traditions of literature, hymnography, and painting bequeathed to them by their Protestant, Catholic, and Orthodox forbears, and so it is encouraging to see this journal quietly insist that, as Image founder Greg Wolfe says, beauty can save the world. The art they nurture and promote stands as a direct counterpoint to the vapid, feel-good, Precious Moments style that has ruined too many palates. So go encourage them back with a subscription.